New release: Adding to the wave of ITC soundtrack news this week, Screen Archives Entertainment has announced that Varese Sarabande will release an expanded 2CD edition of music from the 80s series, Knight Rider. Composer Stu Phillips definitely explored the synth sounds of the day, but Spy Vibers might enjoy this one. 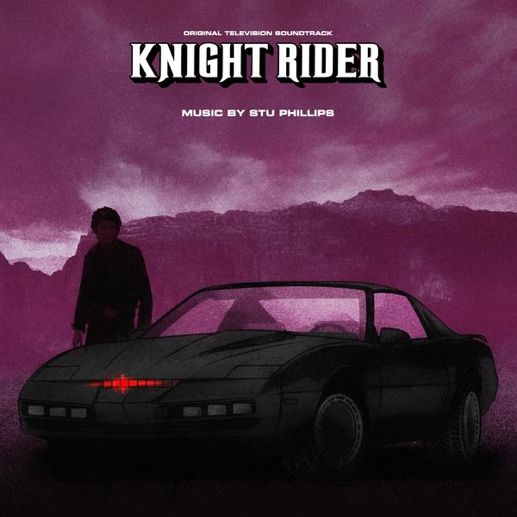 From the press release: "Varese Sarabande Records announces the release of the music from the beloved original 1980s television series, Knight Rider. The show ran for four years on NBC and made stars out of David Hasselhoff and his car, KITT. The series featured music by the great Stu Phillips (Battlestar Galactica, Buck Rogers in the 25th Century, The Fall Guy, The Monkees, Quincy and The Amazing Spider-Man). The series theme song is one of the most memorable and much-loved themes from any television series. In 2005, Film Score Monthly released a single disc limited edition CD collection of music from the series, which quickly sold out. Our new expanded 2-CD set includes music from the limited release on the first disc, while the second disc features completely unreleased score selected by Stu Phillips. The album was supervised by Stu and features all new artwork and notes. Limited edition of 2,000 copies." More info here. Spy Vibers, also please check out my new book (over 700 pages!) about one of America's most successful cartoonists. Enjoy! Selected Spy Vibe Posts: ITC Soundtracks, Spy Vibe Radio: Public Eye, UFO Prime, Spaceship to Mars, Modesty Blaise Companion, Spy Vibe Radio: Fantomas, George Day, Fantomas Blu, Dark Shadows Doc, Bedazzled Blu-ray, Mary Quant Exhibit, Laika Calypso, Lost in Space Japan, Spy Dust Calypso, Atomic Cafe, John Barry Mono, Interview: John Barry Book, Land of the Giants Score, Skyfall Concert, Dearest Emma, Spy Vibe Radio: Upperseven, Ogilvy at Elstree, Mabuse Propaganda, Bond Beatles Day, Spy Vibe Radio: Liquidator, Diabolik LP, Fab Dresses, Eurospy Music Collection, Beetle Bailey in West Berlin, Why Mort Walker?, Spy Vibe radio: The Beatles Help!, Avengers Critical Guide, The Spotnicks, Benny Spies, James Pond 0017', Satire Stones, Annette Andre Book, Cat Day, Spy Vibe Radio: Get Smart, Caine: My Generation, Interview: Ian Ogilvy, Horror of Party Beach, Sylvie Vartan Renown, Ringo At 78, Dark Shadows Strips, Spy Vibe Radio: Flint, Archie Batman 66, Paul at 76, Beatles Pac-Man, Spy Vibe Radio: Jerry Cotton, The Invaders, 007 Horowitz Book Tour, McGoohan/Prisoner Event at Elstree, The Prisoner Interviews Vol 1, British Underground Press, Interview: Fab4 Mania, Bond Cocktail Book, Bond at Bletchley, Spy Smasher, Spy Vibe Radio: Peter Gunn, Agent Zero M, New Prisoner Comic, Dr. No Villains Edition, Spy Vibe Radio: Danger Diabolik, Dr. No 60th, Oy-Oy-Seven, Spy Vibe Radio (UFO), Cold War Comic Strips, Thunderball Event, Mission to India, Mort Walker Celebration, Peter Wyngarde Celebration, Batman 66 Exhibit, Prisoner Fifty Event, Ian Fleming Publications 2017-2018, Interview: Ed Hulse Pulp, Avengers Audio Drama, Interview: Callan At 50, Interview: Playboys, Spies, Private Eyes, TWA Returns, Spy Vibe Radio 8, Interview: Ryan Heshka, Mid-Century Modern Schulz, Agent Werewolf, Mata Hair Exhibit, Johnny Sokko 50th, Interview: Trina Robbins, Eddie Izzard, The Prisoner Capt Scarlet 50th, Hugh Hefner R.I.P., Jack Good R.I.P., Interview: Shaken Not Stirred, Callan 50th, Spy Vibe Radio 7, The Prisoner 50th Event, Spy-Fi Event, Kaho Aso 007, Two Million, Bo Diddley, Carnaby Pop, Le Carre Events, Billy Bragg Skiffle, Elvis 68, Jack Kirby The Prisoner, Casino Royale Concert, Review: The Prisoner Vol 2, Interview: The Prisoner Essential Guide, Maud Russell Mottisfont, Spy Vibe Radio 4, Batman Gallants, Adam West R.I.P., Village Triangle, Roger Moore R.I.P., Spy Vibe Radio 3, Sgt Pepper 50th, Satanik Kriminal OST, 60s Overdrive, Make Love in London, Spy Vibe Radio 2, Spy Vibe Radio 1, James Bond Strips, Propaganda Mabuse, Interview: Police Surgeon, XTC Avengers, 1966 Pep Spies, Batman Book Interview, Exclusive Fleming Interview, Avengers Comic Strips, Robert Vaughn RIP, UNCLE Fashions, Thunderbirds Are Pop!, Interview: Spy Film Guide, Lost Avengers Found, The Callan File, Mission Impossible 50th, Green Hornet 50th, Star Trek 50th, Portmeirion Photography 1, Filming the Prisoner, Gaiman McGinnins Project, Ian Fleming Grave, Revolver at 50, Karen Romanko Interview, Mod Tales 2, Umbrella Man: Patrick Macnee, New Beatles Film, The Curious Camera, Esterel Fashion 1966, Exclusive Ian Ogilvy Interview, 007 Tribute Covers, The Phantom Avon novels return, Ian Fleming Festival, Argoman Design, Sylvia Anderson R.I.P., Ken Adam R.I.P., George Martin R.I.P., The New Avengers Comics, The Phantom at 80, 007 Manga, Avengerworld Book, Diana Rigg Auto Show, The Prisoner Audio Drama Review.